Too Dirty Fer The Hawgs! 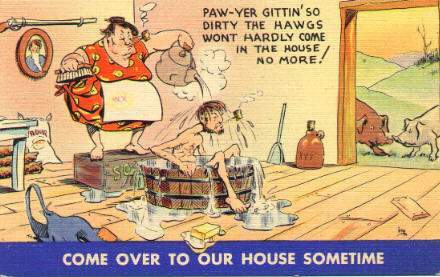 We haven’t always had the convenience of a nice warm shower. There was a time when you had to draw water from the well and heat it up so you could bathe. Taking a bath was a chore for sure (pronounced like “shore”) and as such a real man tried to avoid it at all costs. Usually the woman of the house had to force the poor man to take a bath against his will. Times have changed and oddly enough it is now considered normal for a man to take regular baths, or showers. Yes truth is often stranger then fiction! My wife and I once took a nice country drive out to Germanton, North Carolina. We drove down a pretty road with farmland on either side when all of a sudden, around the bend we came upon a filthy white double-wide trailer with cats, dogs, chikens, and goats in the front yard. The funniest sight was the two giant hogs lying nose-to-nose on the front porch! It stunk!